As agreed by all the panelists, there are great potentials for e-commerce based businesses to flourish; however, entrepreneurs still struggle to find funding as the majority of investors in the region still doubt the sector. The lack of faith and the choice to invest in a less risky field made it harder for entrepreneurs to find those who will foster their projects. Yet, in the past few years, more and more e-commerce businesses are on the rise and there are many improvements in the sector and the opportunities for growth are huge, even if it still needs more work and effort. Banks – like QDB’s SMEs equity funds– and incubation centers – QBIC and DIC – dedicated to e-commerce and entrepreneurs are tailoring better business and funding programs. Another challenge that the panelists discussed was the search for talent. It is vital to find good people, build solid infrastructure and work quick to rise – it’s a very competitive environment. 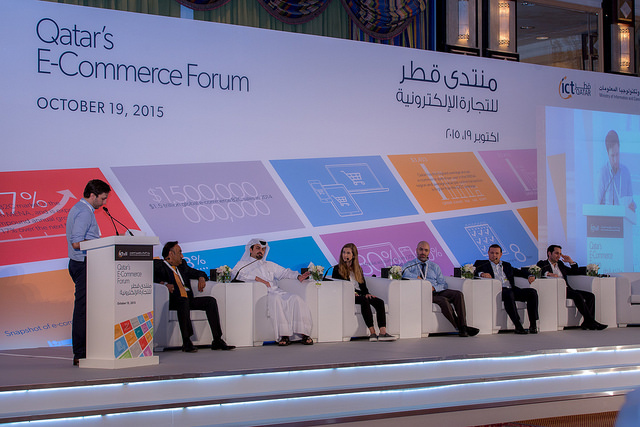 The current e-commerce SMEs need to trade better. The ultimate goal is growth, so as an entrepreneur you have to set your company’s goals so you can measure your effectiveness and to figure out how to optimize your services. As Dr. Eyad said in the panel, it’s hard getting funding everywhere, so commit and execute your idea in a great way to attract investors. Perseverance is key and you have to try many methods to get investors to fund your project; it is the entrepreneur’s job and responsibility. The panelists as well discussed how pricing and fast shipping can make or break a business in order to compete with international businesses, such as Amazon. There is also the urgent need to figure out how to solve the challenge that most customers still on cash only basis. This adds to the process of a business and have high opportunity costs. With all those challenges and efforts, the question remains if there will ever be an e-retailer as big as Amazon and Alibaba in MENA! The panelists (and me) are optimistic that it can happen and it’s only a matter of, when? and who? For the whole panel and more on the forum, please check this video.